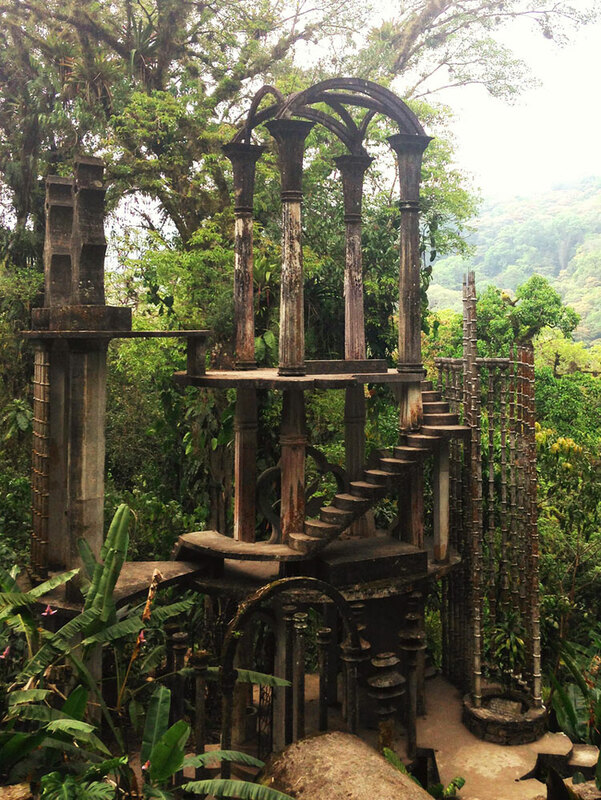 Located in the jungles of Mexico, Las Pozas is a Surrealist’s dream come true. 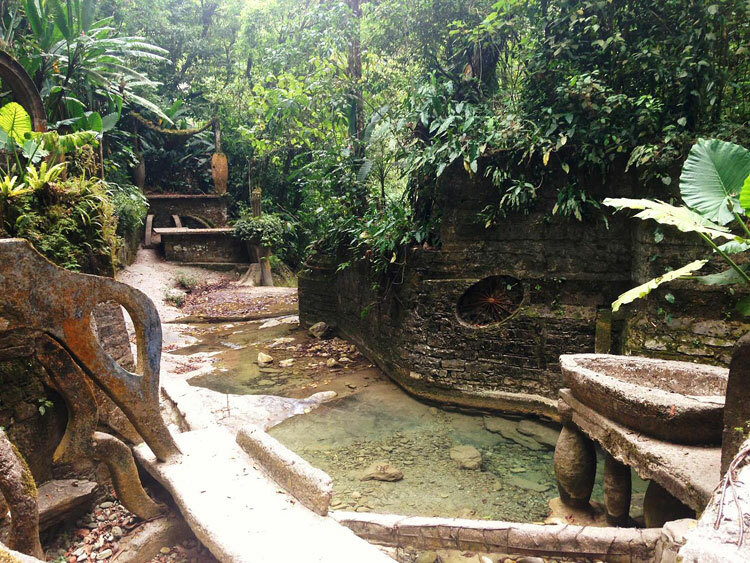 Part Eden, sculpture garden, secret city, and something else entirely, the “Pools” were created by Edward James, an eccentric British aristocrat, poet, and patron of Surrealist art. 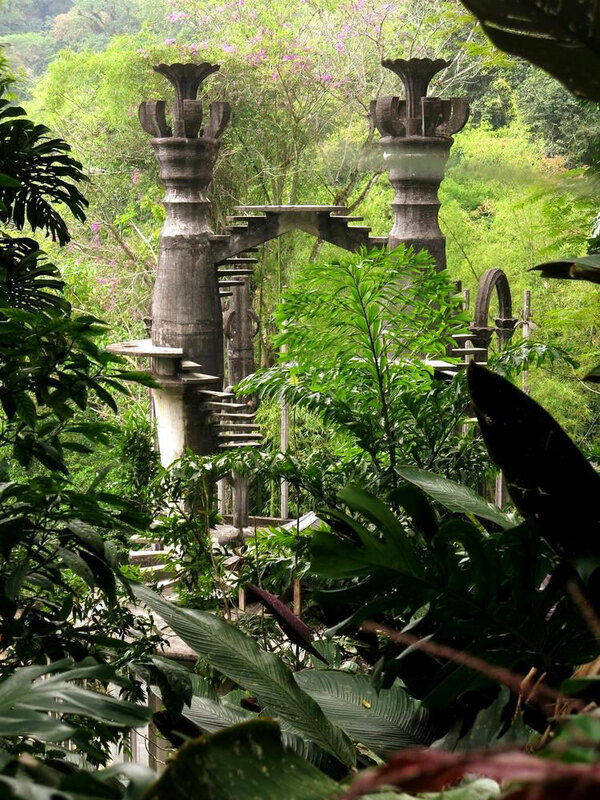 James discovered Xilitla, a mountainous town seven hours north of Mexico City, in 1945 with guide and eventual friend Plutarco Gastelum, and decided that he would build his surrealist garden there. 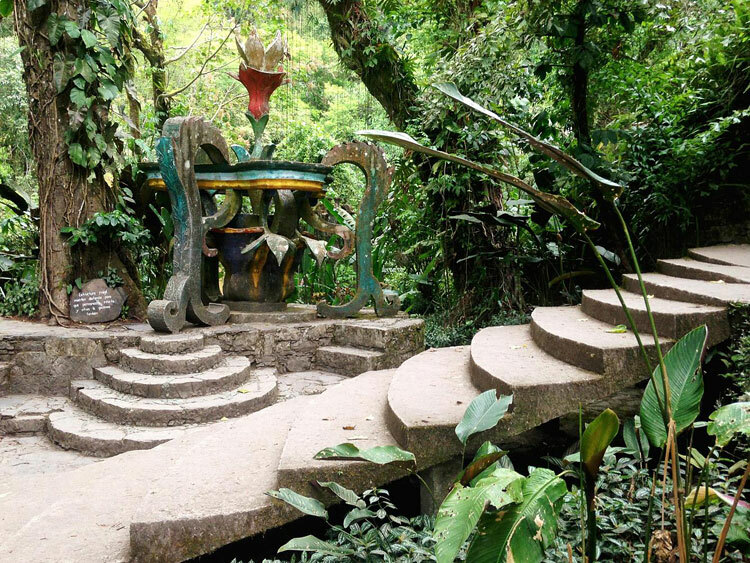 Starting in 1949 and working over several decades until his death in 1984 James, Gastelum, and a crew of 150 locals created 36 concrete Surrealist sculptures over 80 acres of lush land that included natural waterfalls and pools. 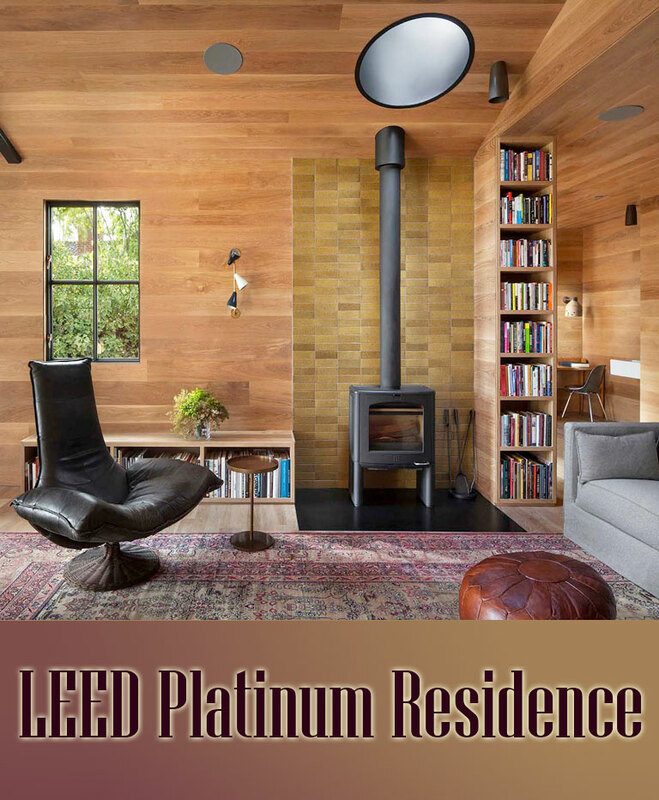 The project cost more than $5 million, a significant portion of which came from the sale of his extensive art collection. 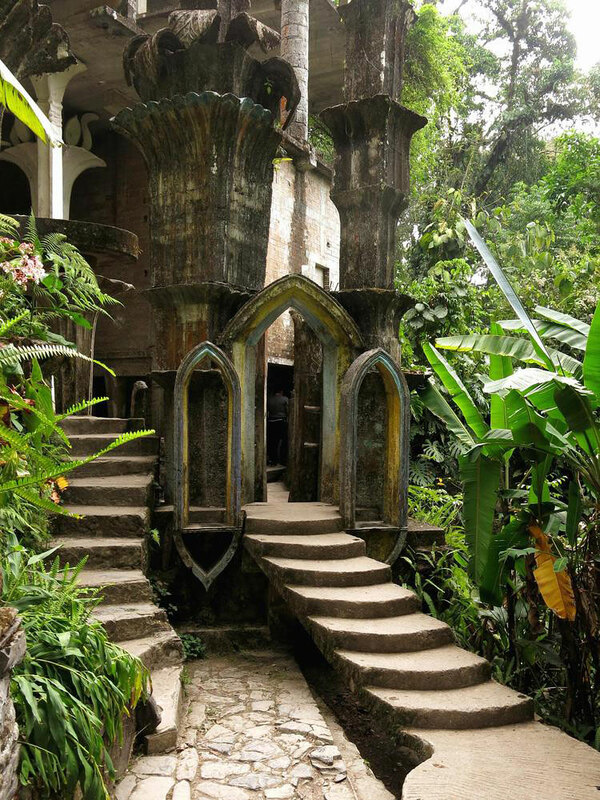 The project first began as a flower garden and a menagerie of sorts for animals, but when a frost wiped out his orchids in 1962—it is said that he had 29,000 of them at one point—James began constructing a “perpetual” garden inspired by the flowers, the Huastecan jungle surrounding him, and, of course, the Surrealist art movement he so adored. 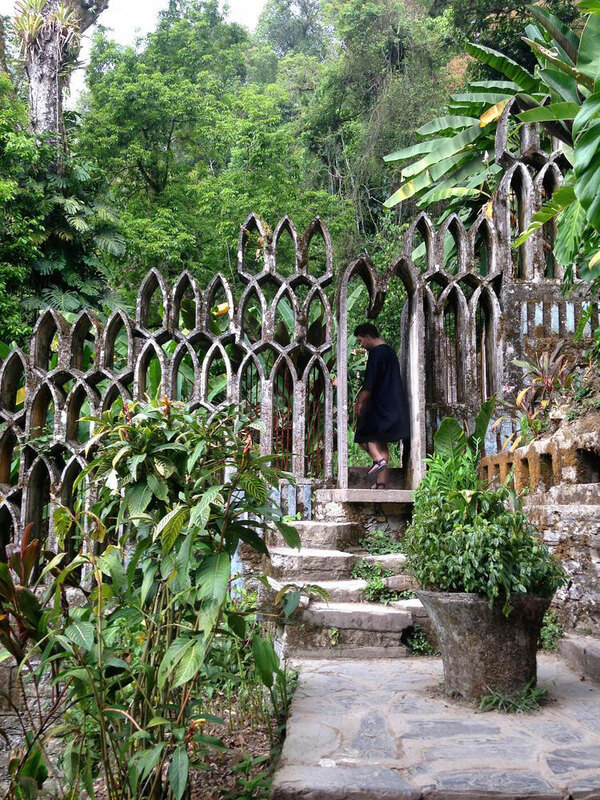 The structures are both architectural and sculptural, with gothic arches, spiral staircases, terraces, pavilions, and columns with floral capitals populating the space in a seemingly random fashion. There are also stones snakes and a bath shaped like an eye. 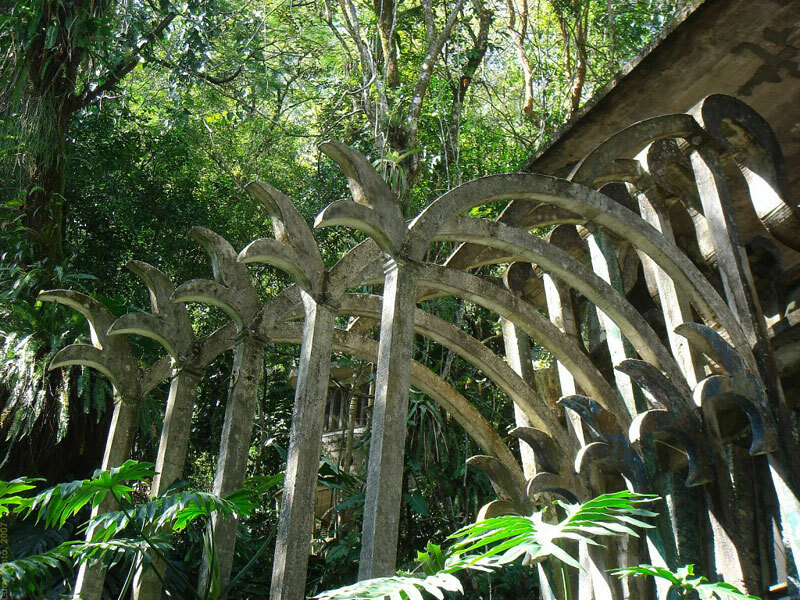 Some of the sculptures were inspired by the shapes of exotic plants and trees in the surrounding jungle; others, by the convoluted forms in the immense collection of works by the surrealist artists James had assembled back in England. 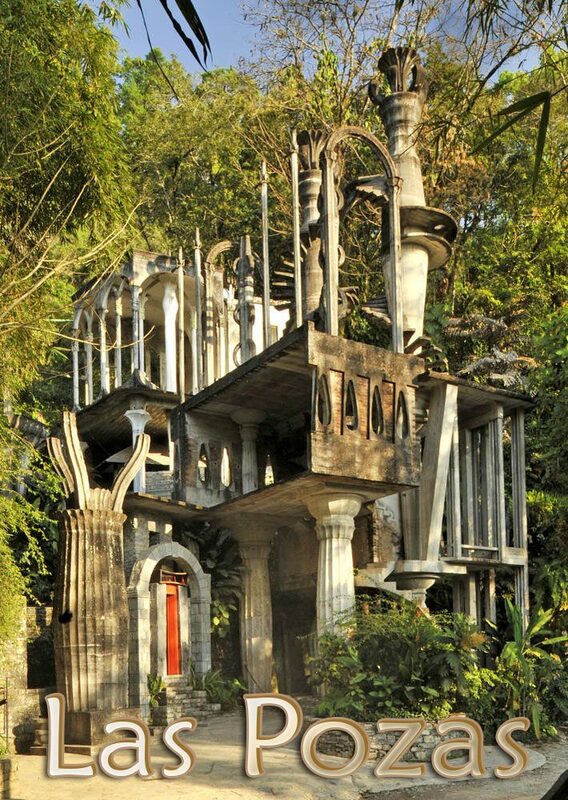 Among his fantastical structures were totem poles, hidden rooms, teetering towers, and staircases leading to nowhere. James gave them baffling names like The House With Three Storeys That Could Be Five and Temple of the Ducks and instructed the hundreds of artisans who’d worked for him over the years to leave many of them unfinished. A 1978 British television documentary filmed him strolling beatifically around his domain: He was big-bellied beneath a poncho, had an unkempt white beard, and green parrots were perched on his shoulders. 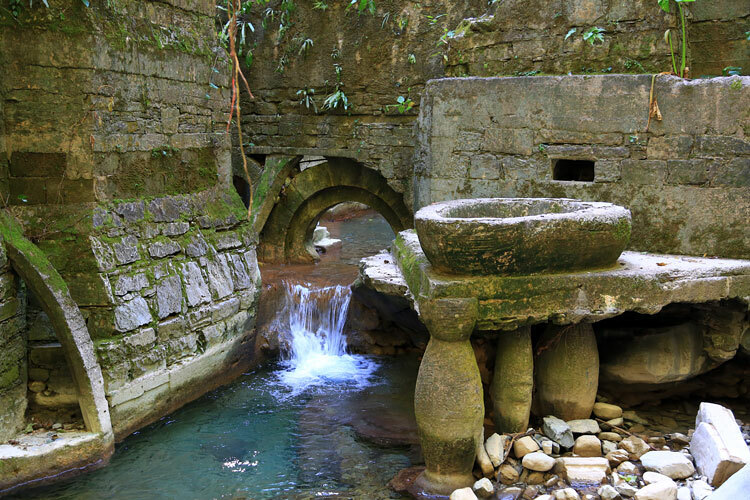 After James’s death, in 1984, Las Pozas was cared for by the family of Plutarco Gastelum, who had befriended him 40 years before, when Gastelum was the handsome young manager of a telegraph office in Cuernavaca. 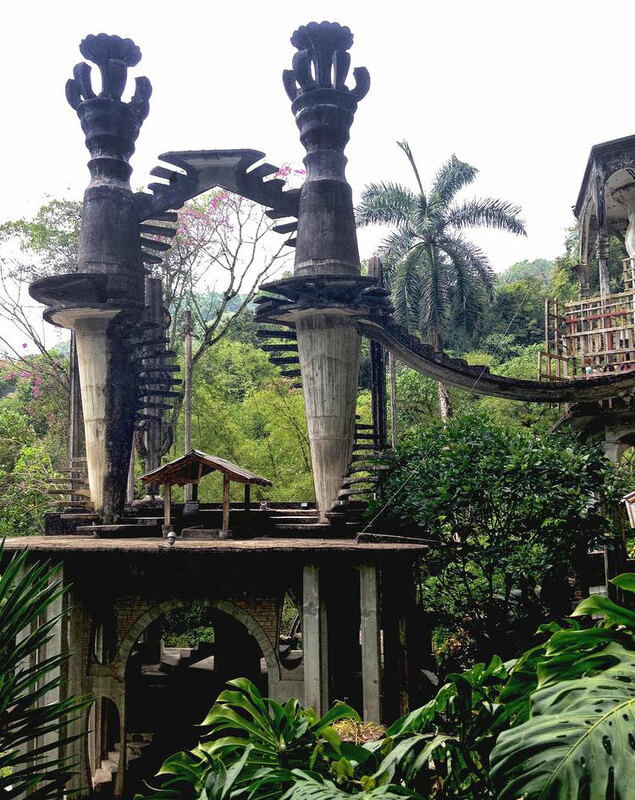 Having helped James find Las Pozas in 1947, Gastelum worked there as foreman on the creation of both the orchid garden and the concrete follies. 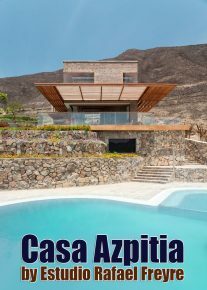 He married a local woman and they had four children, who called James Uncle Eduardo. 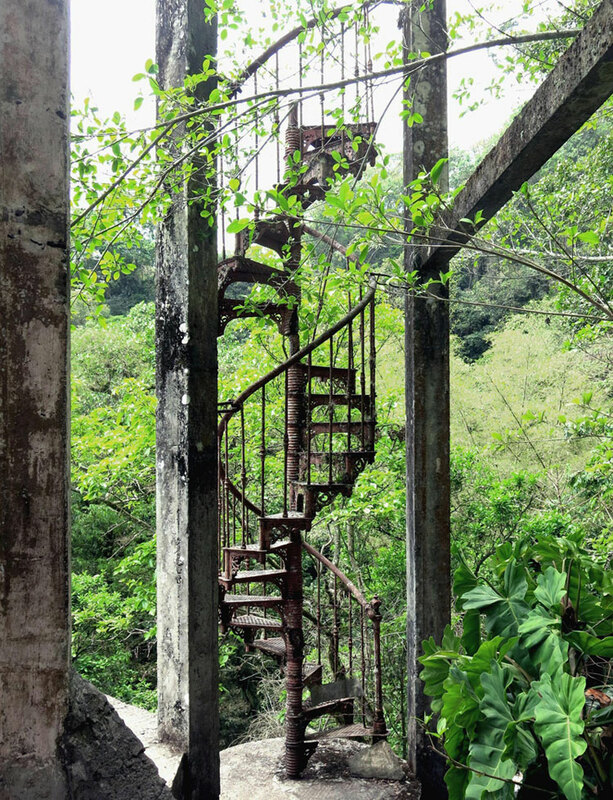 James eventually adopted the children, but his will did not provide for the estate’s upkeep, and the Gastelums could not afford to maintain it. 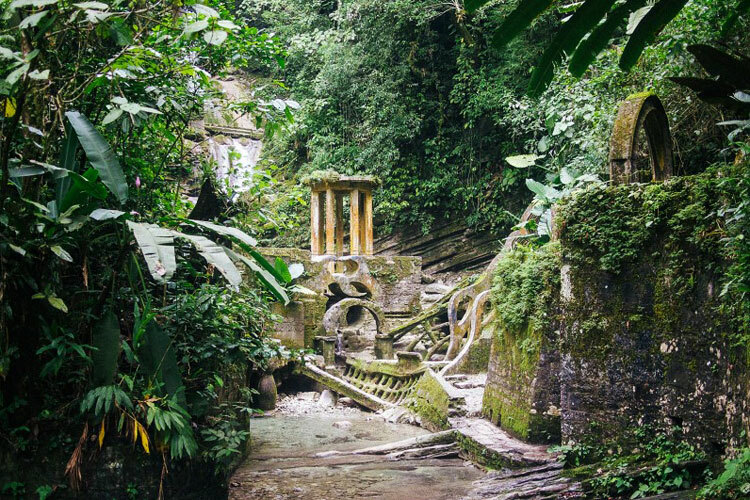 The carefully cultivated plants died, the animals in the menagerie had to be released into the jungle, and the sculptures were soon overgrown with foliage. 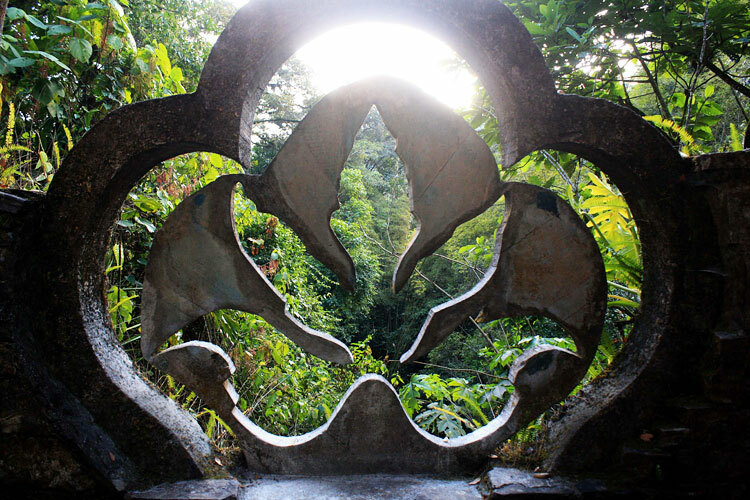 A few dedicated surrealist fans continued to make the tortuous journey through the mountains to Las Pozas each year, but the stories of the follies built by an eccentric multimillionaire in so beautiful and far-flung a place seemed increasingly apocryphal. 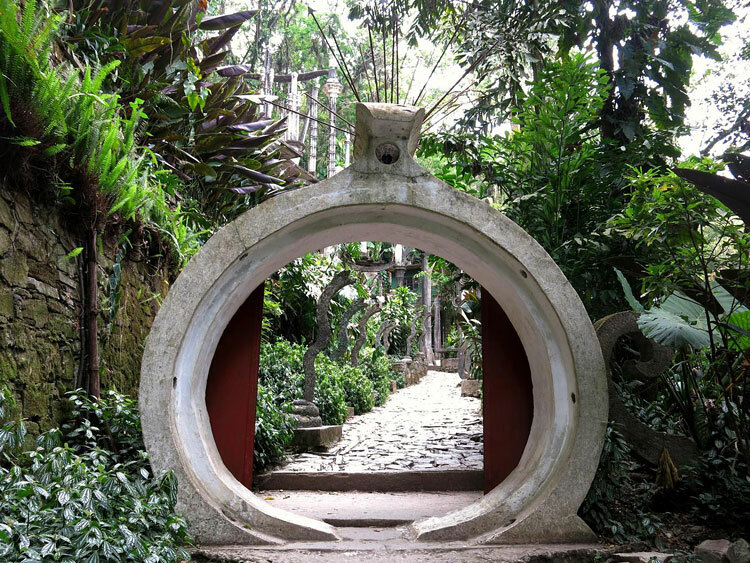 In 2007, the estate was acquired by Fondo Xilitla, a charitable foundation formed to run it and to restore James’s sculptures. Since then, what James called his Surrealist Xanadu has become a little more accessible. 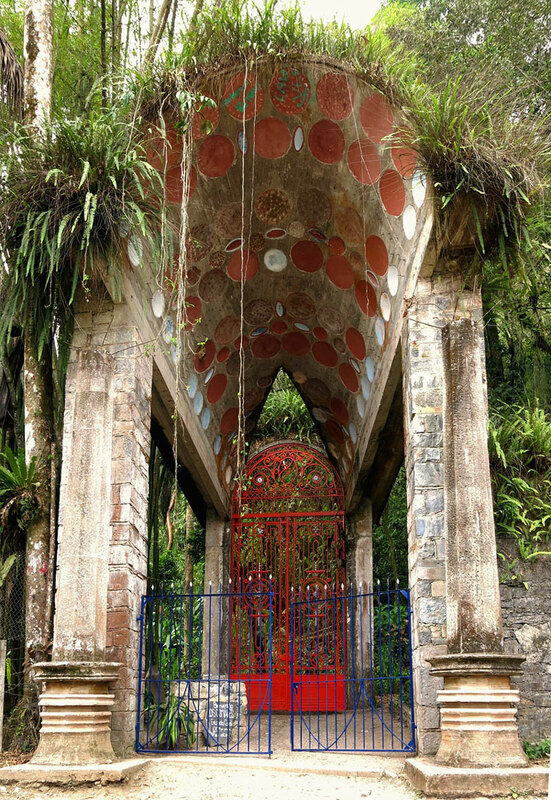 Something like Las Pozas is only built once in our history, and wouldn’t exist but for the esoteric union of a series of one-off conditions: the personality of Edward James; his immense, inherited wealth; his close relationship with the Surrealist movement, including the likes of Salvador Dali, Rene Magritte and Leonora Carrington; the architectural freedom which Mexico offered at the time absent a strict building code; the wild fertility and remoteness of the jungle; and chance meetings with people who could actually help him to pull the whole thing off – Plutarco Gastelum, postmaster, chief amongst them. Clearly, these fantastic works could not be replicated in our ordinary cities, but they certainly present a new way of looking at the reality of architecture we produce every day. 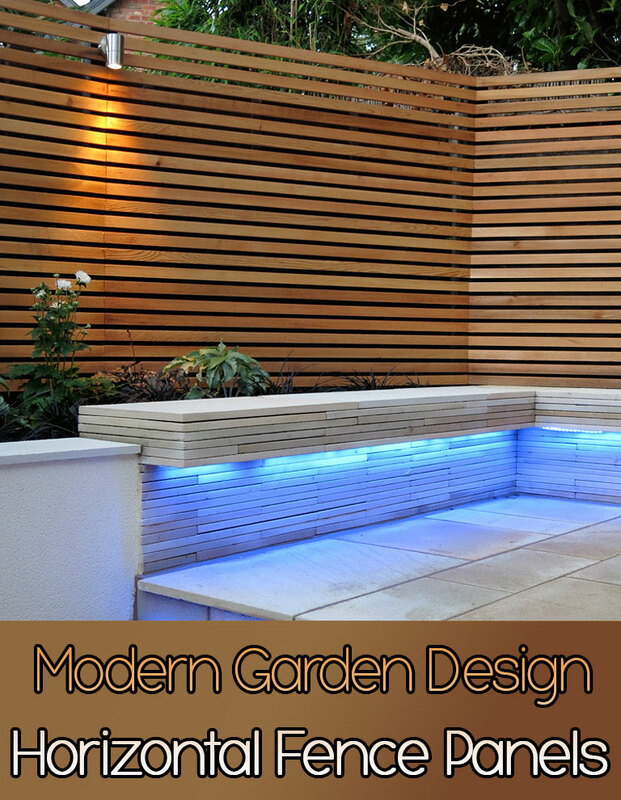 It is through new perspectives that we can imagine new ways of living.